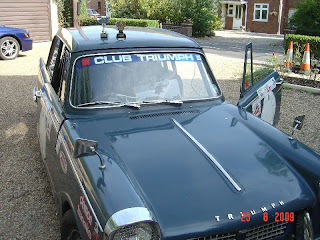 Club Triumph runs several rallies thoughout the year, organised by its members for the club. These range from 12 Car Rallies that run on a Sunday, lasting just a few hours in daylight, to more adventurous events that cover many more miles and distance. Many CT members also enter rallying events run by other clubs, sometimes as an invited CT guest of that club, using their Triumphs in amongst more modern cars, at all levels from Treasure Hunts to long distance Historic Regularity and Special Test events. Click the Rallies/Calendar link on the right-hand side panel, to see all CT's rally events for this year. We also run a Mini-Series of rally events, using our own and other club's events, to try and encourage members to use their cars more competitively if they wish and to give a platform on which to compete with like minded people. The Rallies Mini-Series format can be seen by clicking the Rallies Mini-Series link on the right-hand side panel. Club Triumph Netherlands also run two special night rallies per year, and these can be entered by any Club Triumph member. Again, look at the Event Calendar on the right-hand side panel and you will see these along with all the other rally type events.